New year, new resolutions, right? A few years ago, a friend introduced me to the idea of a theme for the year and I've been making a theme ever since: create, strength, etc. Then, you take that theme and think how your resolutions relate to it. This year I wanted to do things a little bit differently. I knew I wanted a theme. At first, I thought that 'uprooted' might be a good theme. The more I thought about it, however, the more I thought it was a bit negative. I wanted a positive twist to my theme. I decided 'rooted' was a better word to explain what I was trying to get at. I want to be rooted in my beliefs and goals, to know that they are already a part of me, not something new, like a shiny new shirt or fancy new housewares. And I decided I needed to draw it out in my bullet journal. I listed words at the bottom roots of my tree as the base of all my ideas and goals for the year. Then, I added actions and ideas that related to each of my main roots. Now I see this as a more holistic approach to planning my year. I can always look back and see if I am living the words. And you can too! 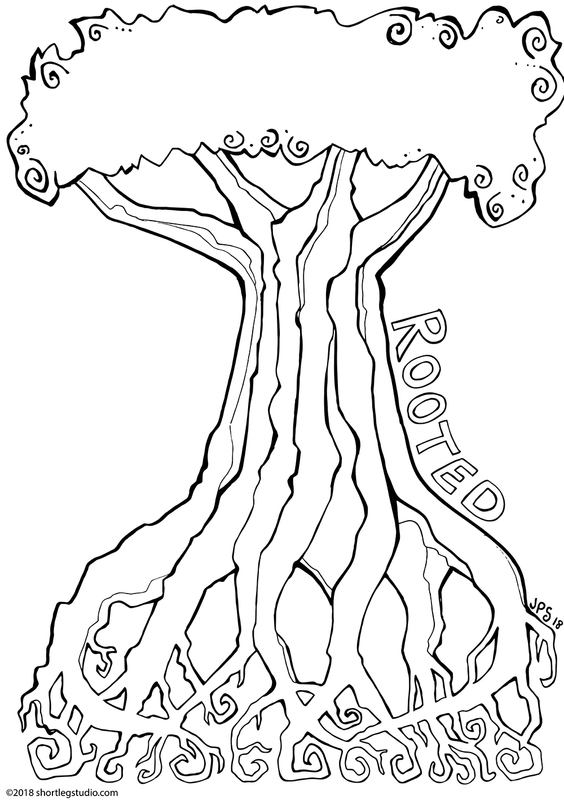 I created a PDF of my Rooted Resolution Tree and you are welcome to download it and print it out and color it and create your own manifestation of your new year. Have fun!